The house is perfect for any type of Nashville getaway. It's a completely renovated and professionally decorated 3 bed 2 bath house. It's located just north of the city. Downtown Nashville is 2 miles or a short Uber ride. Two of the 3 bedrooms have dressers, closets and queen sized beds, the Master bedroom has a King. Adjustable central heat and air keep the house at your preferred/perfect temperature. The kitchen is stocked with all essential food prep items and stainless steel appliances. The laundry room has a fully functional washer and dryer. There is a 55" flatscreen in the main room with Comcast cable and WiFi Internet. The house also has a central alarm system installed for additional security. We supply coffee, soap, dish soap, trash bags, laundry detergent, and dishwasher detergent. Great house for entertaining or writing, Nashville is music city after all. Close to everything Nashville has to offer. Nearby amazing restaurants include Butchertown Hall, Silo and City House. 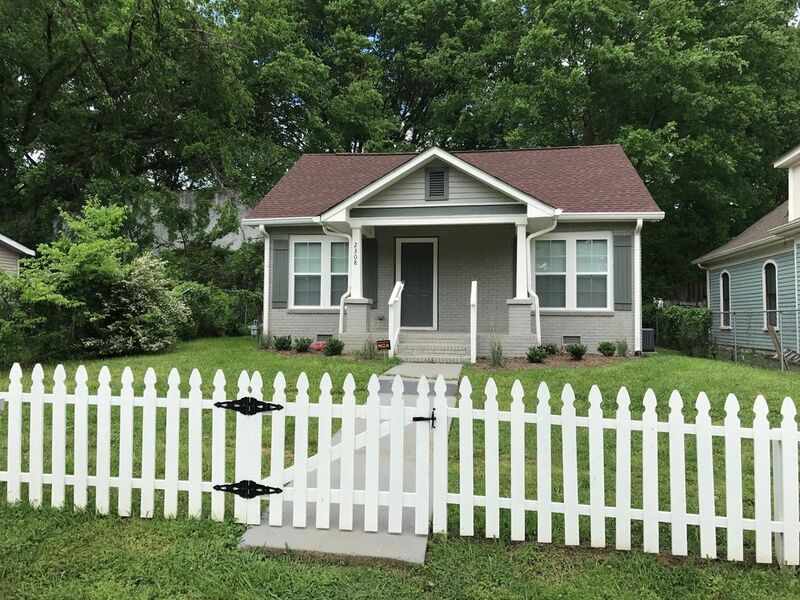 1.4 miles from Broadway, one block from the Farmers Market, Bicentennial Park and less than a 1/4 mile from the new Nashville Sounds Baseball Stadium. 1.8 miles from Ascend Amphitheater, 1.4 miles from Bridgestone Arena and the Ryman Auditorium. The New Tennessee State Museum and Library adjacent to Bicentennial Park. Thanks for your interest, we are excited to have you in our home and look forward to making your stay in Nashville a memorable one. *$59.00 Property Fee is an Accidental Damage Waiver up to $1,500. Doesn't cover smoking inside, intentional acts, gross negligence or your personnel items. You can purchase additional insurance if you like. **This is a NON-SMOKING property, if you smoke inside this property you be charged $500.00. Hello! My name is Libbie and I currently live in Nashville, TN with my husband, Shawn, and our 3 kids. I have lived in the beautiful state of TN for over 13 years now and we love living near Nashville and all it has to offer! This property is completely renovated and is a short uber ride to downtown Nashville. Great central location close to German Town, Sounds stadium (minor baseball team) Downtown and everything Nashville has to offer. Shampoo, soup and body wash provided. 10 rolls of Toilet tissue provided. Along with towels and bath mats. Stainless with filtered water and ice. The house was absolutely beautiful but the surrounding area was a little run down and it was a little to far from downtown. This is a darling house that was well appointed and perfect for three couples on a long weekend. The interior is exactly as pictured. We had a wonderful time! The neighborhood is evolving but still a little "uncomfortable " at times. Neighbors could be heard yelling at each other daily, but we had ZERO problems. We kept to ourselves and they did the same. The alarm helped ease the minds of the nervous Nellies in our group. Dont overlook this darling house because of the address. Very Nice. Loved it. Easy to Uber anywhere. Vacation was great. Place was amazing. Place was absolutely amazing. Beds were very comfortable and place was very clean with everything supplied, except food.highly recommend even though the neighbourhood was a little sketchy. We had 6 of our 8 Uber drivers tell us it was a bad nieghbourhood but we never experienced any danger and felt quite safe. In fact we hardly saw anybody outside and only a couple cars drove by. Highly recommend. Great place to stay and close to downtown. House was awesome. Very accommodating. The neighborhood was a little sketchy but had no issues during the stay. Our group of 6 really enjoyed the home itself. All the bedrooms and bathrooms we needed, nice furniture, and a back alley driveway to park our rental car in. The dishwasher did not work, so that was the one challenge we ran into. This is probably my fault, but I did not pay enough attention to the comments about the neighborhood. When we pulled up we were very surprised that the home is in a less than ideal area and was by far the nicest in the surrounding streets. That may not be important to renters, but for us it made our stay less comfortable. That being said, we had no issues and set the alarm at all times. I would have rented the property again due to the home itself and Libbie (very responsive and friendly), but I would not for the neighborhood. I’m so sorry about the dishwasher, our cleaning crew had it working just fine when they got there, just needed to push start :) .. as far as the neighborhood, it’s a transitional pocket of downtown Nashville, we have had this house on VRBO for over 2 years and never had an issue.. the alarm system is there for your comfort.. I’m glad that helped! Thank you for your kind review about the house!